Do you know you can also create a folder in your pc that will be undelete-able for everyone? If you don't know then their in this post we are showing you to make a folder that will undeleteable.I mean you can't delete it, (you can delete it but not as you deleting other folders). Let's how we can create a folder that undelete-able? 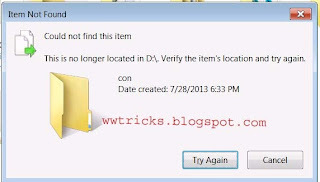 We will use command prompt to create undeleteable and renameable folder in pc. We can only create the folder with name "con,aux,lpt1.lpt2...lpt9". As we can't create folders with these names by right clicking and "new folder" but if we create these(using cmd) then it will not destroyable using the default method. You can not create the folder in C:/ drive. To make a folder undeleteable just follow the below steps. 1. )Fist of all Go to start->Run or press windows key+R and type in run 'cmd'. 2. )Command prompt window will pop-up. 3. )Now type in cmd D: or E: (if you want to make folder in D then type D:) and hit enter. See the below picture how i typed. 5. )Now you created a folder named "aux" in D drive which is undelete-able. You can make a try to delete it or tell your friends to delete it, when you click on delete folder a window will pop up like this. 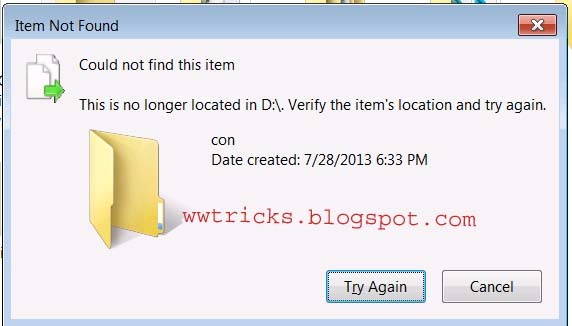 Now if you want to delete this folder then you again open command prompt and type D: or E: and hit enter. Then type Rd aux\ and hit enter. Thats it...Now check the folder, deleted! What did you mean bro? Please comment related to post.